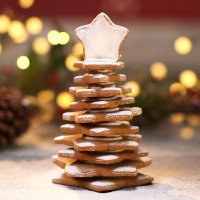 This recipe uses festive gingerbread to make an eye-catching centrepiece the kids will love. You will need a set of 5 star-shaped cookie cutters, ranging in size from 4 to 8cm, plus a 2cm round cookie cutter and a 3cm round cookie cutter. 1 Preheat the oven to 170°c, gas mark 3. Line two large baking trays with baking parchment. Melt the butter, sugar and syrup together in a medium saucepan, stirring occasionally, then remove from the heat. 2 Sieve the flour, bicarbonate of soda and ginger into a bowl and stir the melted ingredients into the dry ingredients to make a stiff dough. Turn out onto a lightly floured surface and roll to a thickness of about 5mm. 3 Stamp out 6 of the smallest star shapes, 4 of each of the remaining star shapes, 8 of the 3cm rounds and 10 of the 2cm rounds. Transfer to the lined baking sheets, leaving plenty of space between each biscuit. Return to the fridge for 10 minutes until firm. 4 Bake in the preheated oven for 12-15 minutes until they’re a light golden brown, then transfer to a wire rack and leave to cool. Meanwhile mix together the icing sugar and egg white until smooth then spoon into a piping bag. 5 To assemble a tree, use the icing to stick one of the largest round biscuits onto the centre of one of the largest stars. Continue to build layers, descending in size, saving one of the smallest stars for the top. 6 Coat the smallest star with icing then use a little icing to stand it on top of the tree. Brush the tips of the stars with a little water then dust with icing sugar. This recipe contains raw egg and is therefore not suitable for the young, pregnant women, elderly people or those whose immune systems are weak. This recipe was first published in Tue Nov 11 14:29:00 GMT 2014.